WDR: "You have hundreds turn up at your gigs in Leeds now. Was it very different in the past?" Xero, Louis and Gene collapse into fits of helpless laughter. WDR: (also laughing) "......Tell me about those great successes." Louis: "You mean when it was just us and the landlord. Us, the landlord and the person on the door"
Xero: "Yeah but Joshua's usually there in spirit isn't he?" Xero: "Behind the bar, upside down usually"
WDR: (Totally mystified) "Who is Joshua?" Xero & Louis (in unison) "Joshua Tetley"
WDR: (still nonplussed and wondering what the hell they are on about): "Oh yeah?" Gene: " Mr Yorkshire "
Xero: "Yeah - Mr Yorkshire"
WDR: (starting to bristle) " Who is Mr Yorkshire...I don't know? " 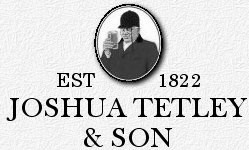 Xero & Gene: (in unison): "Joshua Tetley!" Xero: "Wears a red jacket and a silly hat and he's got a monacle and he's always looking at half a pint of beer....isn't he?" Xero: "Everybody knows who Joshua Tetley is!" WDR: " Well....I don't, and I don't suppose the people in Ger...."
Xero: "The Famous Brewing Magnate.....He's got a brewery in Leeds"
Louis: "That's the nicest thing about Europe.....Not having to buy your own drinks...the free beer"
Xero: "Yeah you play some gigs in England and you get paid and you spend it all on booze and you wind up with no money...just beer"
WDR: " So you used to get, like thirty five quid a night back then?" Xero: " We used to....A long time ago.....In the olden days....When dinosaurs roamed the Earth"
WDR: "But why is it so difficult to get anywhere in your own country?" Gene: ( almost shouting ): "Sharks!" Xero: "Sharks! The world's full of sharks, with teeth like this, trying to rip us off and drag us down into the depths."